At the end of the battle of the Nivelle Soult withdrew his forces to the area immediately around the strongly-defended town of Bayonne. Throughout the Peninsular War Bayonne had been the main depot for the French Army and was fiercely loyal to Napoleon. The town's defences were based on the sound principles laid down by the great French engineer, Vauban. To the west of the town lay the Atlantic and on the east the river Adour. On the northern bank of the Adour lay a strong citadel which commanded the town, while the ground to the south of Bayonne was bisected by streams, woods and enclosures, the ground itself being very muddy and soft after several days of hard rain. Wellington planned to approach the town from both the south and east, an advance from this latter direction being intended to threaten Soult's communications with the interior of the country. In deciding upon this course of action Wellington was taking a calculated gamble as he would have to divide his army in two, part of it advancing along the Atlantic coast from the south, while the remainder would cross the river Nive - which flows south-east from Bayonne - and approach from the east. Soult himself had established a defensive line running south-east from Bayonne along the right bank of the Nive as far as Cambo. The line was defended in strength and a flotilla of boats on the Adour enabled troops to be ferried from one bank of the Nive to the other without any trouble. The Allied army was reduced in numbers at this stage of the war following Wellington's decision to send all the Spanish troops, except Morillo's, back to Spain. This was as a result of numerous unsavoury incidents involving the Spaniards who sought revenge after years of French persecution. Disorder was rife amongst them, something which Wellington could ill-afford. He could not risk the possibility of a resistance movement similar to that which had dogged the occupying French in Spain and so ordered them home. Nevertheless, Wellington still had 63,500 men at his disposal, slightly less than Soult, but had a distinct numerical advantage in cavalry, 8,000 against Soult's 600. Unfortunately, there was little scope for effective use of cavalry over the ground around Bayonne. The operations against Bayonne were hampered by bad weather and it was not to be until December 9th that the operation to cross the river Nive got underway when Hill, with the 2nd Division and Le Cor's Portuguese division, crossed at fords close to Cambo, while Beresford, with the 3rd and 6th Divisions, were to cross the Nive by pontoon bridge at Ustaritz. Having seen Wellington divide his army Soult was quick to seize his opportunity and on the evening of December 9th, amidst heavy rain, some 50,000 troops under D'Erlon began to move silently forward from Bayonne ready for the attack the next day. Shortly after dawn on the gloomy, misty morning of December 10th Hope's 1st and 5th Divisions, some 30,000 troops, were attacked and driven from Anglet by D'Erlon who then advanced as far as Barouillet. 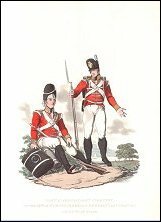 On Hope's right the Light Division was attacked and driven back two miles to the village of Arcangues where it held on grimly throughout the rest of the day in what was one of the most peculiar duels of the Peninsular War. The church at Arcangues was quickly crowded with men of the 1/43rd who were soon engaged in a duel with some French artillery. The Light Division had been pushed back by four French divisions before finally drawing itself up on a position on a ridge astride the village of Arcangues. The French guns were situated on some ground about 400 yards from the church and presented a nice target to the highly trained and experienced veterans of the 43rd. The old church was and still is lined by galleries inside which were quickly manned, the 43rd smashing in the windows to open fire while others threw themselves into firing positions in the churchyard. Although the church was hit about eight times by round shot that smacked into the walls the 43rd's marksmen wrested the initiative from the exposed French gunners, forcing them to withdraw leaving the British as victors and having left behind them 12 guns. Throughout the next two days heavy fighting raged across the area as Soult attempted to throw back Wellington's force that remained on the left bank of the Nive. The attempt failed, however, and so Soult turned his attention to Hill's force, numbering about 14,000 men, which was still on the right bank of the river. The British force here had been severely reduced when Wellington ordered Beresford to recross to the left bank following Soult's attack on the 10th. To meet the impending threat against Hill Wellington again ordered Beresford to return to the right bank but the pontoon bridge connecting the two halves of the Allied army was swept away on the night of the 12th after heavy rain had caused the river to swell. This left Hill isolated with a relatively small force, which was now attacked by 35,000 French troops who had come forward from their positions in and around Bayonne. The ensuing battle, although officially part of the battle of the Nive, is often called the battle of St Pierre by the British, the French choosing to call it Mouguerre after a small village above which now stands an obelisk to the memory of Marshal Soult. The battle of St Pierre was a bloody one and for Hill a close one which swayed one way and then the next as troops on both sides were thrown helter-skelter into the action. Ground lost by the Allies was regained at bayonet point until by noon Hill was throwing in the last of his reserves. However, with the pontoon bridge at Villefranque having been repaired two British divisions, the 4th and 3rd, were thrown across, the 6th coming up from Ustaritz, and by the time Wellington arrived Hill was assured of victory. Wellington's arrival heralded the start of a general advance which forced Soult back into Bayonne. It was a close call - Napier, the great historian of the war, called it the most desperate of the whole war - and losses were high, 1,500 on the Allied side and about 3,500 on the French. When Soult returned to Bayonne he no doubt reflected on his failure to defeat Wellington having attacked half of the Allied force with the whole of his own on two occasions. His attack had failed, however, and the morale of his troops sank even further. In order to avoid being cut off in Bayonne he withdrew the bulk of his force east along the Adour after leaving about 10,000 troops under General Thouvenot to defend Bayonne. The battle of the Nive brought an end to the year's campaigning and the Allied troops settled into camps to the south and east of Bayonne as the cold winter weather set in. As one officer of the Coldstream Guards wrote, "Thus ended the campaign of 1813, commenced on the Douro and concluded on the Adour." It was the crossing of that river which would mark the resumption of Wellington's operations in 1814.